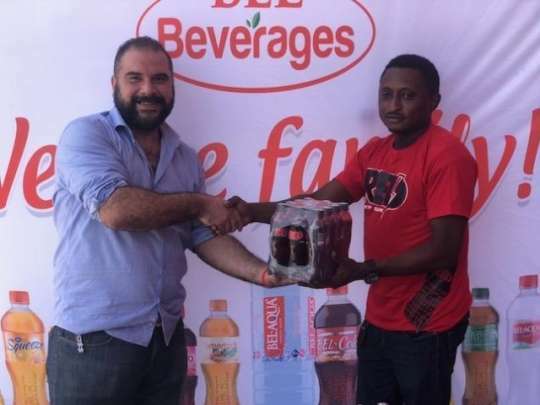 Bel Beverages Ghana Limited, is the official beverage sponsor of the 2019 Kwahu Easter Mountain Marathon (KEMM). The beverage outfit, has donated assorted soft drinks, including energy drinks and T shirts for athletes to the organisers of the marathon. The donation, is to take care of the refreshments needs of close to 1000 athletes, volunteers and organisers expected to participate in the ever popular 42.195 Kilometre mountain marathon. Mr. Ahmed Elesawy, head of Sales and Export, Bel Beverages, who made the donation said, his outfit was excited by the marathon, as it coincides with the Easter festivities. He said, they were also excited by the unique nature of the marathon, since it was the first ever mountain marathon in the country. Mr. Elesawy, called on the organisers to ensure a successful event adding that, they were ready for long term commitment. Mr. Benjamin Kofi Asamoah, Competitions Manager at Medivent Consult, who received the items expressed appreciation to the company for their support. He said though the event was in its second year, they were overwhelmed by the massive corporate interest in the marathon. Mr. Asamoah, said the organisers would ensure that the necessary steps were put in place to ensure a successful event. The 2019 Edition of the Marathon is being sponsored by GOIL, StarTimes, Mobisoko and Asempa FM.